Beware Steam and Epic Games Store: WeGame X, the international version of Tencent’s digital video game market WeGame, is finally here. This week, without any fanfare, Tencent quietly released WeGame X to the world, with an early access version available. It’s uncharacteristic of Tencent to launch WeGame X in such secrecy. This may be because WeGame X in its current form really doesn’t have much to offer: Right now there are just 17 games available for download. To be fair, that small number isn’t unusual: When Epic Games Store first launched, it only had four games available. But what matters more than quantity? Quality. One well-known game is worth more than many unknown games. All 17 games on WeGame X are from Chinese companies, with indie games accounting for more than half. The rest of the collection comprises of titles developed by Tencent’s own Next Studios and two wuxia RPGs that come with no English translation. While many of these games are decent (albeit small) titles, they don’t pull the kind of numbers as popular titles like Fortnite, The Division 2, World War Z or Satisfactory, which Epic Games Store has available. The lack of big titles makes Tencent look like a rookie when it comes to digital game stores -- even though it’s the world’s biggest gaming company by revenue. So as of today, what exactly Tencent’s market positioning for WeGame X? It looks like Tencent is just testing the waters for now. WeGame X is just one of multiple moves Tencent has made in recent months to strengthen its position in the gaming industry. 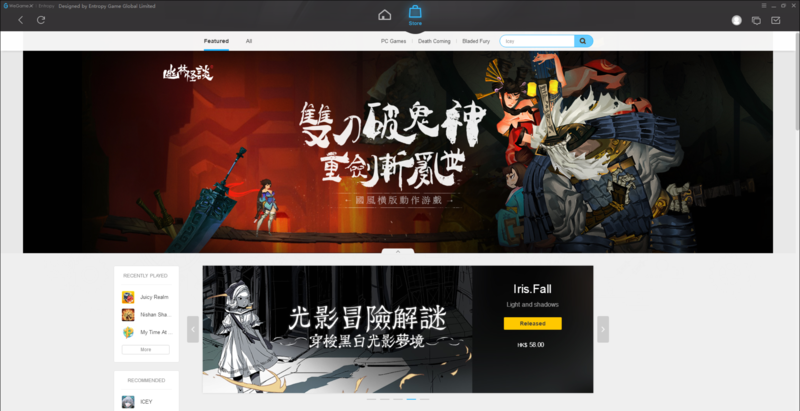 The Shenzhen-based tech giant recently unveiled its own game streaming service in partnership with Intel. Right after Google unveiled Stadia last month, Tencent started allowing some users to test its game streaming service. In spite of Tencent’s best efforts, overseas gamers still don’t seem to trust Tencent all that much just yet. Earlier this year, Epic Games was grilled by gamers as rumors suggested that its Epic Games Store was sending user data to Tencent, which owns 40% of Epic, potentially giving the Chinese government access to that data. Epic Games’ CEO Tim Sweeney fiercely denied any data-sharing with Tencent or any other company. Chinese gamers also have a love/hate relationship with WeGame. They love it because it’s a homegrown gaming platform, but they hate it because the platform is censored due to strict government regulations. This explains the relatively small number of games available in the Chinese store, which has about 170 titles available -- compared to 30,000 games on Steam. So what do Chinese gamers think about WeGame X now that it’s finally here? Rather than celebrating or criticizing it, many wonder if WeGame X and Epic Games Store will work together... or end up cannibalizing one another.